Rated R for strong bloody horror violence throughout, language and brief drug use. 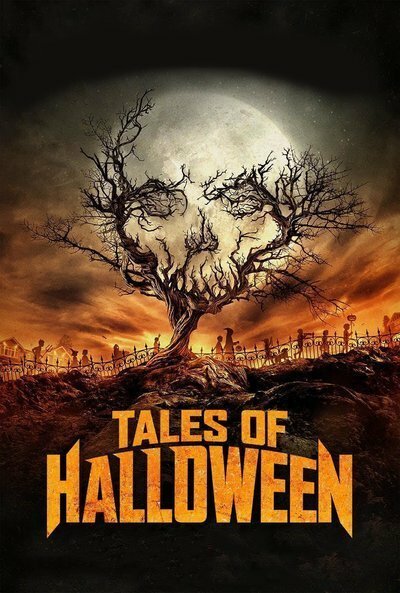 "Tales of Halloween" is a party of a movie made up of ten different shorts, celebrating more than just a holiday but the tricking and treating found year-round in horror films. Lined by an amicable sense of dark humor and a sporadically amusing bloodlust, this hit-or-miss compilation could bring Halloween cheer to genre fans, especially if a prop candy bar named Carpenter, or narration from Adrienne Barbeau, sounds like a horror convention dream come true. Before getting into what makes "Tales of Halloween" a relatively mixed bag, let's start with the delightfully cuckoo. The genre giddiness within Darren Lynn Bousman's "The Night Billy Raised Hell" is downright contagious, especially as it goes full speed on the pranking potential of Halloween, albeit performed by a devilish little boy and a crazy old man. It's one of the smaller bites in the full course but it has the most flavor, as a full aesthetic package (with cartoonish sound design) and a bonkers sense of humor that continues to push its boundaries right up to the end. It's also a refreshing chaser to opening short "Sweet Tooth" (by Dave Parker), which doesn't have the same imagination in its tale of a ghoul who punishes on those who don't share their candy (the ghoul itself is frighteningly designed). Another high point comes towards the end of the shorts series with Mike Mendez's "Friday the 31st," which pits a comically shameless Jason Voorhees knock-off against a very unexpected force; slasher genre jokes ensue, and a lot of blood sprays people in the face. In comparison, it improves upon the previous battling neighbors short "This Means War" (directed by John Skipp and Andrew Kasch) by harnessing the efficiency of scant dialogue in a visually interesting short, while being more inventive with its final showdown, a swan dive into gory madness. For a genre that tends to see women in a certain, shallow way (see: the non-sarcastic costume design for the women as opposed to the men throughout these mini-films), two shorts in particular here try to challenge these representations, but both fail overall. "Tales of Halloween" creator Axelle Carolyn's short "Grim Grinning Ghost," about a woman who might be stalked by a ghoul, is damned by the sluggish pacing that haunted her debut "Soulmate." And then there's Lucky McKee's "Ding Dong," about a woman who becomes a witch to her husband after the loss of a child and inability to conceive. It's another project with his tedious "but I'm a feminist!" attitude, providing a representation both winking and literal of a personal horror, one not justified by a conclusion that's ultimately ineffectual, if not dangerous by its end. But, it does have some ace make-up work in making the emasculating wife a very sinister red. As for the lesser shorts that truly move in and out of the anthology, each at least boasts some type of perk. Paul Solet's "The Weak and the Wicked," which oddly uses the same kind of twist from his more recommendable feature "Dark Summer," has a cool Sergio Leone influence within its anticlimactic tale of bullying; lead actress Grace Phipps steals the show with a snap of her fingers, the fate of the bullied protagonist proving to be less interesting. Or, there's Adam Gierasch's "Trick," which has more finesse in its cinematography than macabre story, as it clumsily dumps body parts on the common punchline that no one can be trusted on Halloween. Even Ryan Schifrin's grating "The Ransom of Rusty Rex" has an exciting nod to previous anthology "Twilight Zone: The Movie," which then volleys the gesture of approval with a John Landis cameo. "Tales of Halloween" wraps up with one of its biggest cheeses, director Neil Marshall ("The Descent"), who unleashes a flesh-eating Jack-o'-Lantern's murder spree a la a direct-to-video splatter-fest shrunken into a few minutes, tying together all of the film's previous tales. Like nearly all of the nine shorts before it, it ends on a klutzy note. Nevertheless, this very funny short has the bloody, goofy taste of "Tales of Halloween," a project that is overall better produced than it is directed. The compilation indulges with constant cameos and references, but is best as a showcase for a few promising filmmakers from indie horror (including cinematographers, make-up designers, and some writers), many of whom are primed for a spookier nightmare.